I first came across Mr Steven P Sparrow and his company 'Go LPG' via a general search on Google. I thought his website was quite informative and then also found him to frequent the LPG Forum. He is often on there giving advice (sometimes quite good advice), however, he often touts for business. On his website he has a special 'Sports and High Performance' section which is meant to instil the potential customer with confidence that their 'sports and high performance' vehicle will be converted properly, safely and that they will be able to notice little or no difference in performance. This, however, was NOT the case. Since having the conversion done in March 2006, I have been back to Go LPG 5 times and his supplier (Autogas World Wide - AGWW) 2 times. Mr Steven P Sparrow took the car in for two weeks. I was expecting the conversion to be done in a week which is what he initially stated, however, he said he was ill and I thought, fine.. such is life, but he did not even offer to refund me the cost of a train ticket - he simply took a very 'arsey' tone stating that we had no contracted date for completion. Then, after having the car for 2 weeks, you would imagine he would do a thorough and professional job.. this, however, was also NOT the case! This is how the engine bay should look pre-conversion (which it did). The first picture shows the car with the engine cover on (library pic). 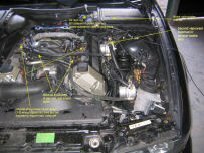 The second picture shows the car with the engine cover off (library pic - notice the two electrical wiring covers). 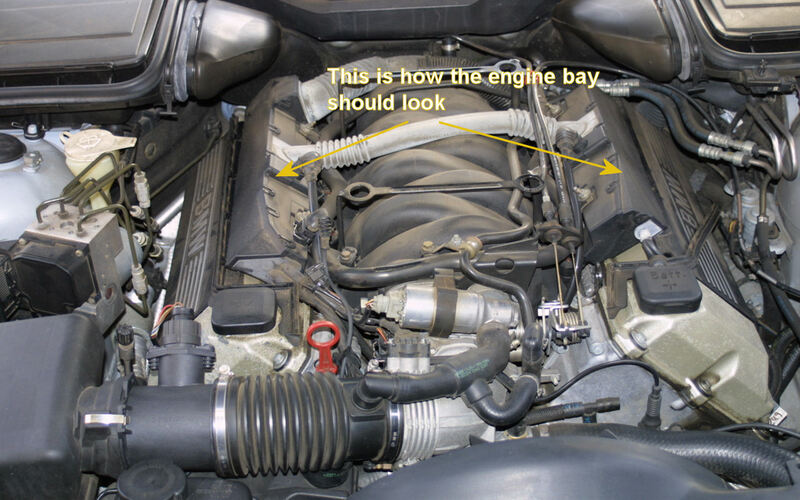 Note: This pic also has an idle-control valve and throttle cables. The pressure sensor and associated pipe which I had to keep pulling off due to over pressure. Incorrectly T'd pipes to the vapouriser - basically, Go LPG T'd the wrong pipes in situ and coolant has been leaking ever since. 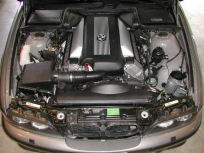 Single vapouriser installed with a 6MM gas supply line (not sufficient for a 300 BHP V8). How the vaporuiser has been botched-in using a bent metal bracket. 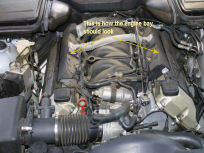 How no thought has been giving to the positioning of the gas fuel rail and associated pipes - they are not symmetrical and lieing across the top of the inlet manifold. The original electrical wiring covers that cover and protect the wiring on either bank of the V8 have been removed and chucked away! The LPG system has been 'tapped' into here instead of doing it the proper way into the ECU. Wires have been left exposed dangerously. At the top of the picture you can see how the air-duct has been hacked and wires put through it then glued with some nasty gooey substance. The gas feed pipes all over the place - no thought or effort has gone into reducing their lengths or placing them symmetrically and neatly. 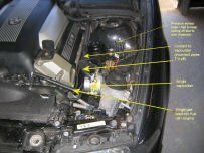 Intake manifold was not removed for the installation, this means that it was drilled in situ and hence, the petrol injectors are VERY high up and no-where near the original petrol injectors = poor performance and emissions. 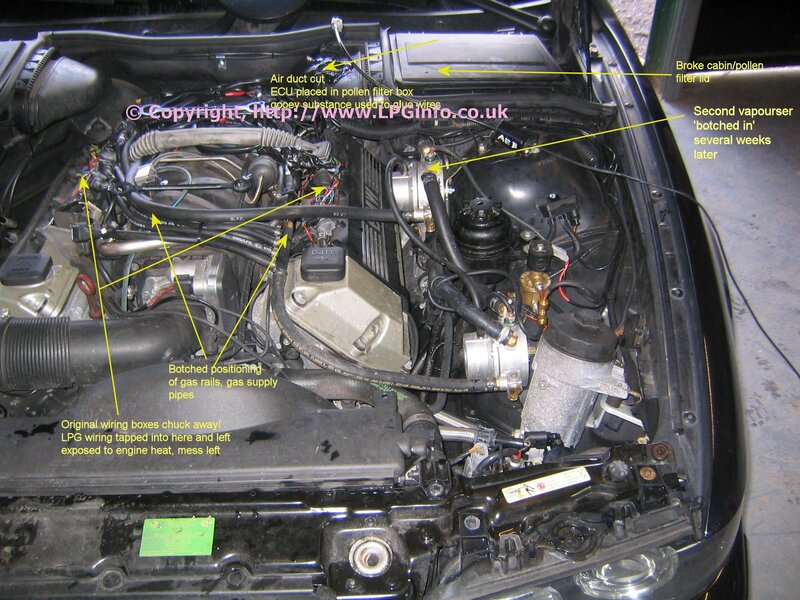 Lots of excess wiring from the LPG system has been left at the back of the intake manifold. At the top right of the engine bay, the air-duct has been hacked and wires put through it then glued with some nasty gooey substance. Drilled in situ (not removed from the engine). LPG injectors no-where near petrol injectors which means poor performance and emmissions. NO WONDER IT GOES LIKE A DOG! Air duct 'hacked' and a nasty gooey substance used to glue some wiring. Electrical wiring cable-tied and put under strain or taped in areas and left! The original electrical wiring covers that cover and protect the wiring on either bank of the V8 have been removed and chucked away! The LPG system has been 'tapped' into here instead of doing it the proper way into the ECU wiring. Wires have been left exposed dangerously. ELECTRICS ARE NOT GO-LPG's FORTE! Here you can see that a 6mm gas supply line has been used (this is not suitable for a 300 BHP V8). In addition, the fuel line has been 'secured' using plastic cable ties (not purpose designed pipe clips) and not even at appropriate intervals! This is hidden behind the rear wheel arch trim. Mr Steven P Sparrow (also known as MacGyver) cut into the wrong heater and coolant pipes meaning that the car cut out unless the heater was on and on a high fan speed so that the auxilliary water pump/valve was also pumping water! He later realised his mistake and thought he would rectify it using an old bit of copper pipe he found lieing around! Look at the picture on the right for proof. I requested that a hole not be made in the body-work for the LPG filler; so, Mr Steven P Sparrow put the filler into the rear (plastic) diffuser... good I thought - WRONG! He BENT the bumper when fixing his metal bracket and only used self-tapping screws to attach it (not even a nuts and bolts!). The diffuser was cut in such a manner that it seemed like he must have used his teeth! Here you can see the bend in the bumper even after installing a new diffuser. Wonderful install 'eh? So great, Mr Steven P Sparrow of Go LPG has issued a UK LPGA Approval Certificate... PASSED!